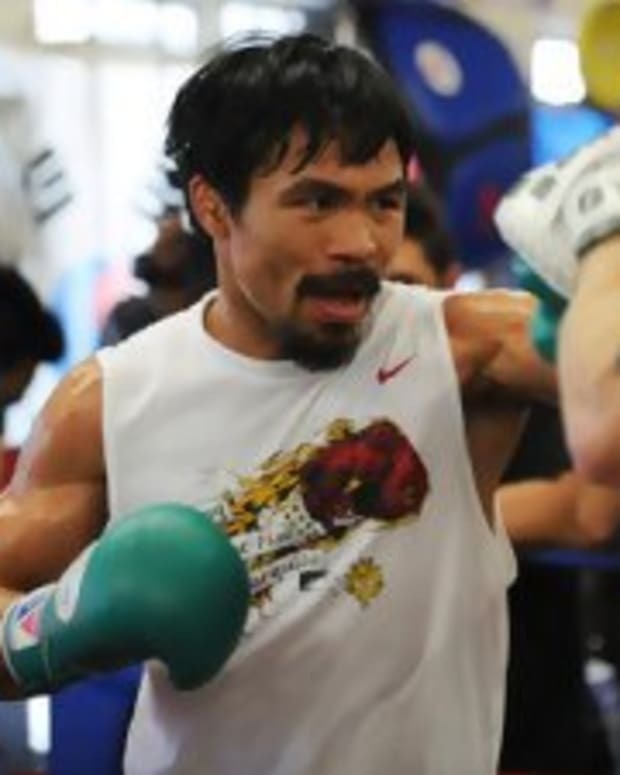 Manny Pacquiao is scheduled to take on Brandon Rios in three weeks, but everybody is already looking past that fight and towards what 2014 holds for the former champion. After he was defeated in dramatic fashion by Juan Manuel Marquez at the end of 2012, Pacquiao’s handlers realized that this year had to be about one thing and one thing only: repairing the Filipino star mentally and physically. That’s why he is only fighting once this year, and it’s going to be against a guy who, while admittedly is very talented, is something of a one trick pony. Pacquiao’s people, everyone from Bob Arum to Freddie Roach, realize that there is no bouncing back from three straight defeats. You can excuse away a botched Timothy Bradley decision. You can shrug off getting caught by Marquez in a fight that, really, Pacquiao was winning. But you can’t do anything about three Ls in a row. There’s no spinning that. Pacquiao needs to beat Rios for there to be bigger, more lucrative fights in the future. What sort of lucrative fights? Perhaps one against Floyd Mayweather Jr. He noted one minor point that might make putting the match together difficult, but indicated it wasn’t a deal breaker. While Arum endorsing Mayweather-Pacquiao is huge, obviously, if for no other reason than him reportedly being one of the biggest reasons why it hasn’t happened to date, far more interesting is his reason for why it may not happen. “If Manny demonstrates that he’s back” isn’t a plea for more money, or less stringent drug testing, or whatever. It’s a point blank statement: My guy may not be good enough to fight the best pound-for-pounder on the planet. It’s impossible to say with certainty what got us to this point. Maybe it was ego, money, PED paranoia or all of the above. But it’s not particularly difficult to see why this bout isn’t getting made now – Arum is scared about what Mayweather might do to Pacquiao.